Painting rags are an important part of every painting project, with WHITE RAGS preferred over coloured rags because they show up the paints easier against the white backdrop of the T-shirt colour, and they are great at absorbing solvents! 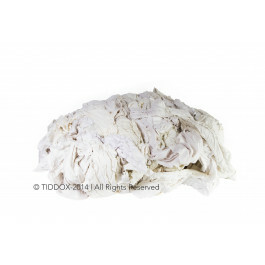 TIDDOX's WHITE T-SHIRT RAGS are made of high quality recycled cotton white t-shirts, so are environmentally friendly. Recycling and reusing resources is a growing trend and a responsible choice that minimises wastage of limited resources. In addition, we make sure that our rags are hygienic through a wash and clean process, and also that they are safe for use by conducting a metal detection process which ensures that they are free from any foreign metals. The cotton fabric in white T-shirt rags is a fantastic chemical and solvent absorbent material. Furthermore, the white colour of the material is ideal for showing up paint and oil colours. WHITE T-SHIRT RAGS also have the added benefit of being a low linting cloth, which makes them a integral component of painting consumables where lint left on a surface can ruin a paint finish. So next time you are looking for a bag of quality recycled paint rags to throw in the back of the ute, give our WHITE T-SHIRT RAGS a try, and enjoy the benefits of peace of mind that come with knowing you have chosen an environmentally friendly, high quality product that is safe and effective for use.